One of the knitting projects that has been consuming most of my time since moving has been this wrap, and I’m very excited to be able to share it. 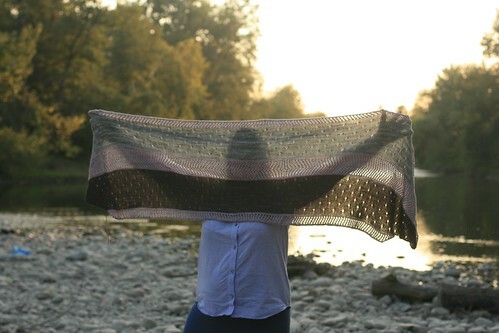 This project also has the distinction of being the first knit that I started and finished in our new city. I made this as a gift for my future mother-in-law, who did a stupendous amount of work in helping us pack for our move, and then generously offered to help us unpack, as well. She didn’t ask for anything in return, but it was such a huge help that I couldn’t not do anything for her. 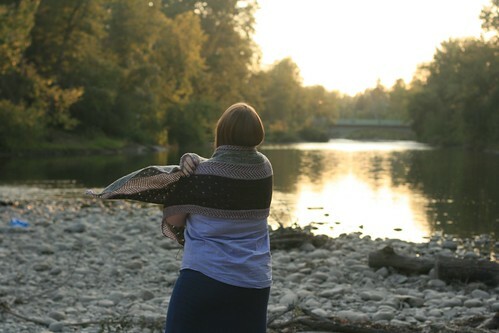 She’s also one of those people who’s almost always too cold, so I knew that a shawl or a wrap would be a good choice. 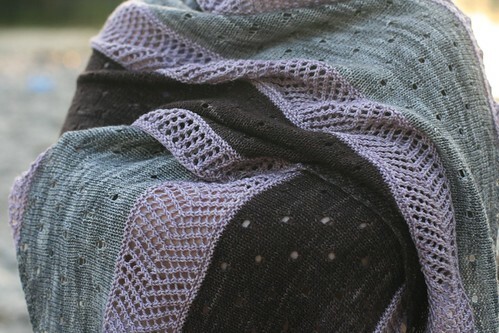 The pattern is Cardinia, which I first saw knitted up as a sample at my old LYS. I chose it both because it’s a nice, basic knit that doesn’t require a lot of thought, and because it’s constructed in an interesting way. The finished shawl is nearly three full skeins of sock yarn. Because you cast on 280+ stitches at the beginning, it looks like you’ve started knitting the full width of the shawl, but the increases go up to a 300-400 st width by the widest part, and yarn starts to disappear pretty quickly. 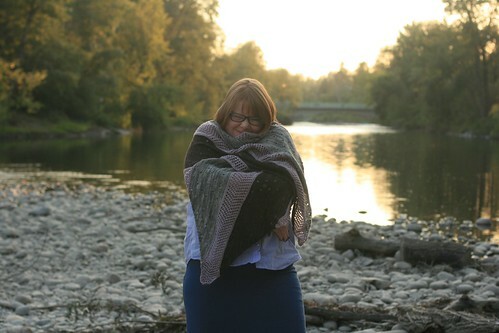 It makes a big, cuddly, generously-sized wrap, though, which I think will make it a really wearable gift. I was a little constrained in what was available to me (I’m still learning about the yarn shops here in Calgary!) so the only way to get the colours I wanted was to knit this in three different bases, with different fiber content, from three different dyers. I must admit, this gave me a bit of an eye twitch. You can sort of tell, but I think only as a knitter – the grey and brown sections have cashmere content, and the pink is a merino/silk blend, so the pink feels a bit rougher by comparison, but it’s not bad. If I had to knit this again (and I might, I’m a sucker for yarnovers on stockinette), I think I’d leave one marker in the center for the stockinette portion, to help me keep track of the center again for the middle lace portion. Otherwise, I think this pattern is a total winner, and I’m really pleased with the finished product – I almost like it too much to give away! ooh, that is so beautiful!! I love the grey and plums together, and the texture looks like it hits all the right notes. I’m not surpised you think you might knit this again.